UniFi® is the revolutionary Wi-Fi system that combines enterprise performance, unlimited scalability, and a central management controller. The UniFi AC HD AP has a refined industrial design and can be easily installed using the included mounting hardware. Easily accessible through any standard web browser, the UniFi Controller software is a powerful software engine ideal for high-density client deployments requiring low latency and high uptime performance. Save money and save time - UniFi comes bundled with a non-dedicated software controller that can be deployed on an on-site PC, Mac, or Linux machine; in a private cloud; or using a public cloud service. You also have the option of deploying the compact UniFi Cloud Key with built-in software. 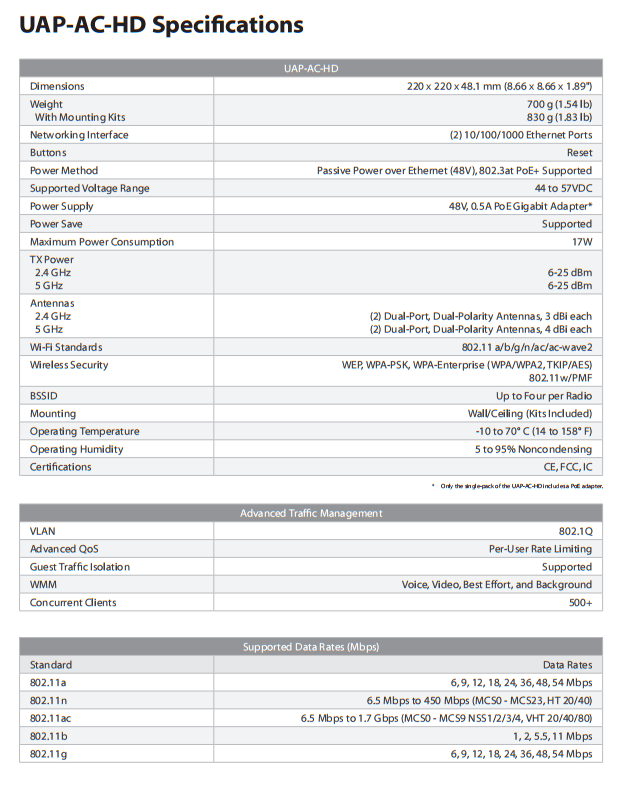 Powerful Hardware - The UniFi AC HD AP features the latest in Wi-Fi 802.11ac Wave 2 MU-MIMO technology. Intuitive UniFi Controller Software - Configure and manage your APs with the easy-to-learn user interface. Expandable - Unlimited scalability: build wireless networks as big or small as needed. Start with one (or upgrade to a five‑pack) and expand to thousands while maintaining a single unified management system. With the UniFi Controller software running in a NOC or in the cloud, administrators can manage multiple sites: multiple, distributed deployments and multi-tenancy for managed service providers. Below are some deployment examples. Click the button below to add the Ubiquiti UniFi AC Wave 2 Enterprise to your wish list.